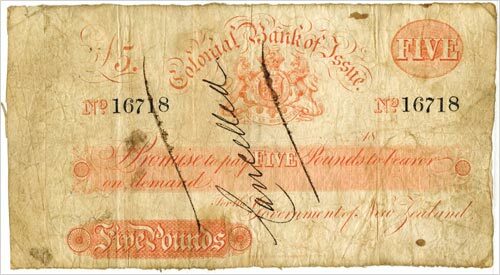 This £5 note produced by the Colonial Bank of Issue is not dated and does not appear to have been issued. This bank was set up by the government in 1850 in an attempt to ensure a sufficient and stable currency. Coins in particular were in short supply and the government wanted people to use the bank's notes instead. The bank was wound up in 1856, partly because not enough people were willing to exchange their coins for banknotes. As was typical in this period, the note is very plain and was blank on the reverse side.